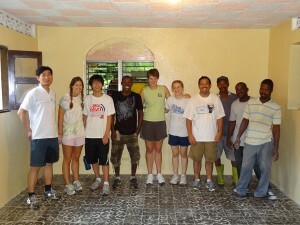 The first team in summer 2012 that arrived to paint and setup the computer school! IIT Haiti (Institute for Information Technology of Haiti) is the idea of Haitian Lionel Legoute who grew up in Simon, north of Les Cayes, Haiti. After serving with many mission teams from the U.S., he had a dream to begin a computer school in his hometown to help train and educate others in his community so they can be productive and begin to build a better Haiti. Education is key to helping the people of Haiti help themselves. Through this computer school, many who might not be able to attend college can receive valuable computer skills that would be useful to various businesses and institutions throughout the country. With the partnership and initial funding from various donors in the U.S., this new school was setup in June 2012. Classes began on September 17, 2012. On February 5, 2014, IIT Haiti took another big step forward as it formed a partnership with the Flore Elementary School in Simon. The first classes with these new students began in March 2014. Classes for younger students and adult learners continues today!